Back in the day, my dad bought a KoalaPad drawing tablet for our Atari 800. Perhaps that very December — in 1984 or 1985, he drew this scene of the front of our house at Christmas time, complete with a view of our Christmas tree through our living room window. So proud was he of his creation that he snapped a photo of it with a Polaroid camera, and that’s the print I am showing to you now. Merry Christmas from Vintage Computing and Gaming! Discussion Topic of the Week: Did you draw any Christmas art on your computer when you were a kid? Tell us about it. Throughout the ages, fans of Christmas have found new and varied ways to express their love for the holiday. In the 1980s, personal computer users joined in the fun, using their machines to host a new breed of animated Christmas greetings that were distributed through magazines, BBSes, or even sold on disk like Thoughtware’s JingleDisk, seen here. Upon inserting JingleDisk into your Commodore 64 or Apple II computer (It’s a double-sided disk with data for the different platforms on each side) and booting it up, the user is presented with a Christmas-themed animation set to various holiday musical standards. It’s fun to watch. There is something about the warmth of the glow from a cathode ray tube screen that lends itself well to computerized Christmas celebrations — perhaps it echoes some primal link to prehistoric man sitting around the fire telling stories. By the way, this JingleDisk came to me by way of a family friend who just turned 40 years old today. Happy Birthday, Chris! Discussion Topic of the Week: Have you ever programmed a Christmas-themed demo or sent a computerized Christmas card? Tell us about it. Twenty years ago this week, Sony released the PlayStation in the United States — on 9/9/95, in fact. The first time I remember seeing a PlayStation in person was a demo unit at my local Blockbuster video rental store. At first they had a single kiosk playing Battle Arena Toshinden. A few months later, they upgraded to a new kiosk with a trio of PlayStations arranged in an outwardly-facing triangle formation (if that makes any sense), with each running a different playable demo. I think that two of the three games were Battle Arena Toshinden and Twisted Metal. The third escapes me. Twisted Metal was a blast. I loved that game. I remember playing as Hammerhead (the monster truck) and running over everybody repeatedly. There is fun in digital mayhem. In 1996, my brother’s best friend bought a PlayStation and Twisted Metal 2 (released Oct 1996), and he brought it over to our house to play with us a few times. We loved it. After that, we knew we had to have one. In my mind, Twisted Metal 2 was the system’s killer app — until Symphony of the Night came out, of course. 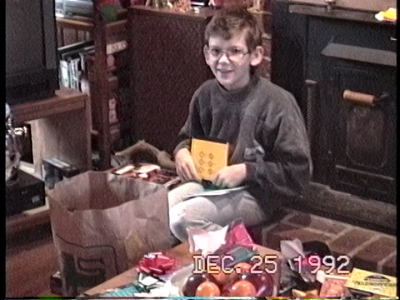 So after asking kindly to our parents, my brother and I got our PlayStation as a joint Christmas present in 1996. I was 15; my brother was 20. Having gone through prior console phases with the Atari 2600 (and 800, which we treated like a console), NES, TG-16, Super NES, and Jaguar, we felt like we were growing up along with the video game industry. The scan you see above is the front and back of the sleeve of the sampler CD that came packed in with our new PS1 in 1996 (titled “Interactive CD Sampler Pack Volume Three”). I would have scanned the disc as well, but I seem to have separated it from this sleeve — maybe I put it in a jewel case long ago. I know I still have it somewhere. Discussion Topic of the Week: When did you get your first PlayStation 1? What were your favorite games for it? I’m a big fan of educational, semi-toy computers like the VTech PreComputer Power Pad (seen here in his scan from the 1994 JCPenney Christmas Catalog) because historians and collectors alike often completely overlook them in study of computer history. I’ve previously written about the much more famous VTech Pre Computer 1000 and even did a slideshow on kids’ computers for PCWorld back in 2011. I don’t have a Power Pad at the moment, but I do have a few other educational computers, including some featured in that slideshow. My favorite is probably the VTech I.Q. Unlimited or the Tiger Learning Computer. But we’ll save those for another day. Discussion Topic of the Week: Did you ever own any educational or kids’ computers? Tell us about them. Discussion Topic of the Week: If you could go back in time and give yourself one Christmas present, any year, what would it be? It’s that time of year again: the Yuletide. Over the past few years, I’ve been posting an annual collection of all the Christmas-related material I’ve written (both for this site and for others) into one place for easy reading. Below, you’ll find list of off-site Christmas slideshows, other features, and of course, plenty of Retro Scans of the Week.